Researchers:Diego Melgar and Richard M. Allen, University of California, Berkeley; Sebastian Riquelme, Juan Carlos Baez, Francisco Bravo and Sergio Barrientos, Universidad de Chile, Santiago; Jianghui Geng, Peng Fang, and Yehuda Bock, University of California, San Diego; Hector Parra, Instituto Geografico Militar, Chile; Michael Bevis and Dana J. Caccamise II, Ohio State University; Christophe Vigny, Ecole Normale Superieure, France; Marcos Moreno, GFZ German Research Centre for Geosciences; and Robert Smalley Jr., University of Memphis. 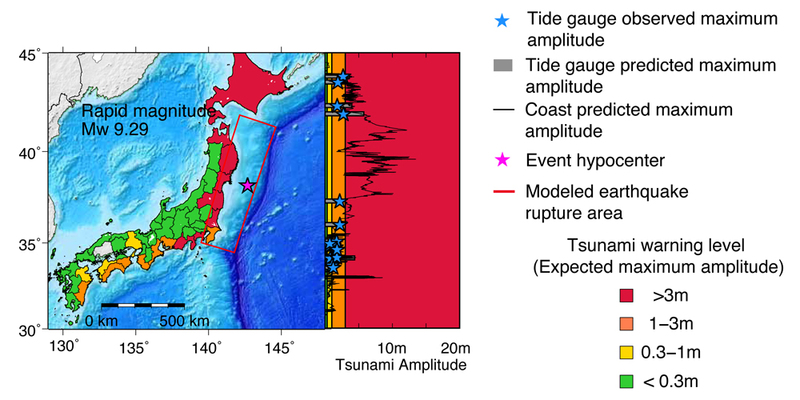 Combining geodetic and seismic observations can significantly reduce the amount of time needed to assess the tsunami intensity generated by a large magnitude thrust fault earthquake along a subduction zone. Through retrospective analysis of four tsunamigenic large earthquakes in Japan and Chile, using available instrumentation, the tsunami potential at the local coast was estimated within less than 2 minutes. Implementing the methods and available observations in national warning agency protocols would improve hazard response, saving lives and advancing other benefits. Tsunamis are rare events, but as tragically observed in the 2010 Indian Ocean and the 2011 Tohoku disasters, they can cause substantial casualties and injuries. Currently tsunami warnings from agencies such as the National Oceanic and Atmospheric Administration’s Tsunami Warning Centers, rely on far-field seismic data and deep ocean buoys far from the tsunami sources. Using these limited data, a tsunami warning can take tens of minutes to generate, which is not enough time to warn local coastal populations. Coastal populations are significant and growing as are coastal observing networks of geodetic and seismic instruments. 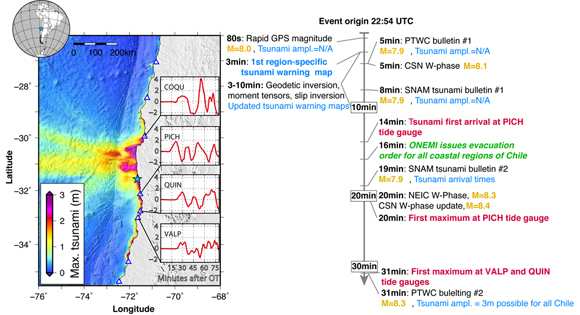 A retrospective analysis of observations from existing networks for the 2010 Mw8.8 Maule, Chile, 2011, Mw9.0 Tohoku-oki, Japan, 2014 Mw8.2 Iquique, Chile, and 2015 Mw8.3 Illapel, Chile, earthquakes shows that rapid tsunami warning maps could be produced within 2 to 3 minutes after the event. The method requires a gridded model of the thrust fault, and onshore topography and offshore bathymetry from NASA’s Shuttle Radar Topography Mission (SRTM). A rapid estimate of the earthquake magnitude is derived using local GPS stations to estimate the peak ground displacement (PGD) or for the Tohoku earthquake, a rapid geodetic source size and slip estimate from the dense GPS network in Japan. The local tsunami warning time was about 1 to 2 minutes after the event for all four earthquakes by combining available observations from seismic and geodetic sites. The rapid magnitude estimates were accurate within plus or minus 0.3 magnitude units, which is more than sufficient for general warnings. For example, for the Illapel earthquake, using the available GPS sites in Chile would have yielded a magnitude estimate within 2 minutes and a tsunami run up map within 5 minutes. This would have been much faster than the tsunami warning center notices that took 31 minutes. The Chilean National Emergency Management Office issued an evacuation notice at 16 minutes after the event based on earthquake estimates and no tsunami run up information. The first tsunami wave arrived at 14 minutes and the maximum amplitude waves arrived between 20 to 30 minutes. In the future, if the available data are integrated into warning systems, communities could receive more effective warnings. Editorial note: The United States is susceptible to tsunamigenic earthquakes from subduction zone thrust faults within local reach of populated coastlines, particularly along the Pacific coast from Alaska to northern California. The Plate Boundary Observatory (PBO), a dense network of GPS and other geophysical instruments can provide suitable observations for rapid tsunami early warnings if the geodetic data is integrated into warning systems. UNAVCO operates and maintains the PBO on behalf of the National Science Foundation’s EarthScope project. Melgar, D., et al. (2016), Local tsunami warnings: Perspectives from recent large events, Geophys. Res. Lett., 43, doi:10.1002/2015GL067100. doi:10.1002/2015GL067100.